In 1985 there was a group of friends who met in the home of Eldon and Eldoris Loberger for a weekly bible study and time of fellowship. Eventually this group grew and decided to become affiliated with Calvary Evangelical Free Church. Three years and two pastors later the attendance of the church dropped from approximately 50 people to 8 families. A congregational meeting was called to officially close the church. During this time two young couples came forth testifying that the church had helped them out tremendously and meant a great deal to them. Seeing by their testimony that the Lord had been moving in spite of the small numbers, the leaders decided not to close the church. With just a handful of people in attendance, the church hung on and continued to pursue a full time pastor. In 1991 the Lord brought Bobby Gandy to the church to fill this position. Bobby was a vital stepping-stone to Calvary Evangelical. 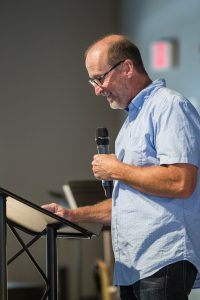 As the church grew the Lord used Bobby to move the body into a much needed, larger facility and prepared the church to begin moving independently. Bobby introduced longer services, instead of the traditional Sunday school and a time of worship. At this time the church’s name was changed to Calvary Community Church. Bobby moved from Calvary Church in 1993. At this time the leadership invited Byron Wicker to temporarily fill the pulpit. Byron had been co-pastoring with Pastor Robin McMillan at Cornerstone Church in Charlotte. In 1994 Byron answered the call to pastor Calvary Church and a year later it received its charter as an independent church. In 1998, Calvary Community Church acquired seven acres of land off of Highway 21 in Mooresville NC on which to build their church. It was built and completed in February of 2000 with approximately 200 people in attendance. Ministries and longtime visions began to come to fruition during this time and the pastoral leadership in the church began to expand. In 2004, the Lord began to speak to Byron about the biblical precedence for changing a person’s name. It was at this time that the church’s name was changed to RiverLife Fellowship from Psalms 46:4. 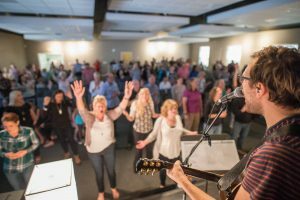 In the years to come the Lord continued to grow the attendance of Riverlife and two Sunday services were being held to facilitate the growth. In October of 2006, a major spiritual milestone was noted as the Lord began an outpouring of his Spirit like never before. This inevitably ushered in miracles, healings and a deeper habitation of the Lords presence. Riverlife’s mid-week breakthrough meetings were birthed from this move and the vision of the church began to shift to the mentality of the Fathers House. Riverlife continues to see the Lord pour out his Glory in increased measure. We are continuing to pursue his presence and are actively growing as a church and in the visions that he has given us.